An innovative hybrid approach for the doublet singularities has been developed, which offers a best-in-class ratio of fidelity and computational costs. This proprietary development takes advantage of the benefits of both high-order and low-order methods. 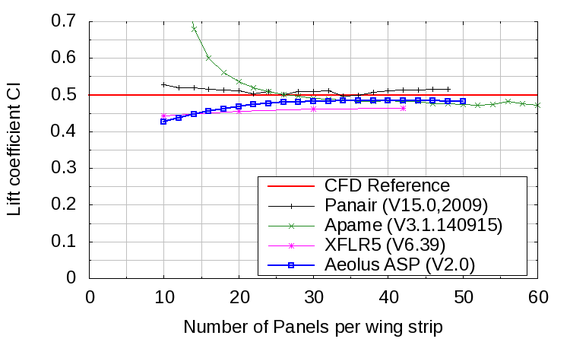 Initially, the panel method kernel in Aeolus ASP has been designed as part of a Aero-Structral Design Optimization framework for conventional and unconventional aircraft wings. Typically, these are large problems with millions of design evaluations. As computational efficiency is a key requirement, the Aeolus ASP kernel has been particularly tailored to this objective. As result, the low computational costs and the parallelization of Aeolus ASP ultimately enabled the built-in shape optimization feature, which you can run on a laptop or desktop computer. Gagnon, Hugo ; Zingg, David W.: Aerodynamic Optimization Trade Study of a Box-Wing Aircraft Configuration. In: Journal of Aircraft 53 (2016), 2016/03/14, Nr. 4, pp. 971–981. ISBN 0021–8669. This paper provides high-fidelity CFD results, which are considered as reference for the present benchmark study. In the CFD reference analysis, the angle of attack has been fixed to 5.406° which yields a reference lift coefficient of 0.5. With regard to the panel method solutions, the figure below shows the resulting lift coefficient as a function of the number of panels in the chord-wise direction, which is a measure of the panel mesh density. 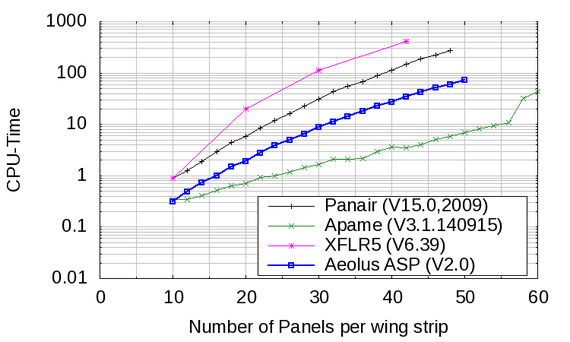 As expected, the high-order method PANAIR converges more quickly than the hybrid method AEOLUS ASP, and the low-order method APAME. The XFLR5 Program exhibits the largest error in this test case. The next important property is induced drag. The plot below illustrates, that induced drag is more difficult to predict accurately. 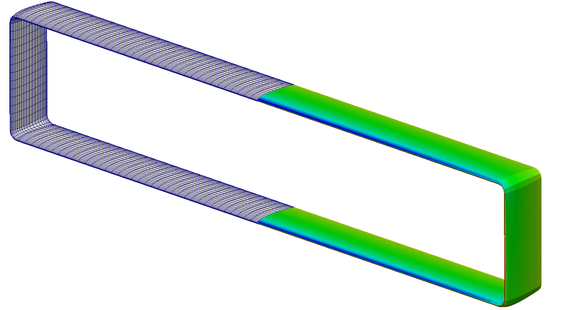 However, AEOLUS shows an excellent agreement with the CFD results, due to a novel induced drag calculation approach. Finally, let us compare the associated computational costs of these three panel methods. Therefore, parallelisation and symmetry features were disabled. 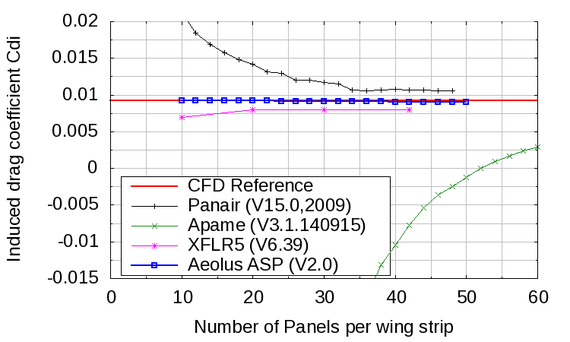 The plot below shows the normalized CPU-time over the number of panels per wing strip. We are constantly looking for new test and benchmark cases. Please don't hesitate to contact us.